This Sunday I went to Hans Tavsens Park in Copenhagen to drytool on two concrete climbing walls with Kristoffer Szilas, Anders Strange Nielsen and Morten Johansen. 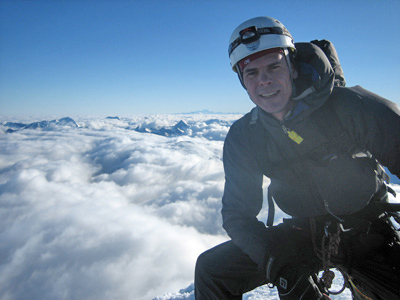 In particular Kristoffer has been very active in making first ascents on the walls which are up to 5 meters high and have just published a drytooling guide which can be downloaded in PDF format here. Morten Johansen leading the left route facing the graveyard on the highest wall (graded D5+). The drytooling experience in Hans Tavsens Park is very realistic compared to mixed climbing on rock: you have to "feel" the holds carefully to find good placements and balance your crampons and ice tools carefully in order not to fall. Finally, the walls are bolted and with top anchors allowing you to lead the routes. Kristoffer making the first ascent of the left route on the short wall facing the graveyard (graded D6-). 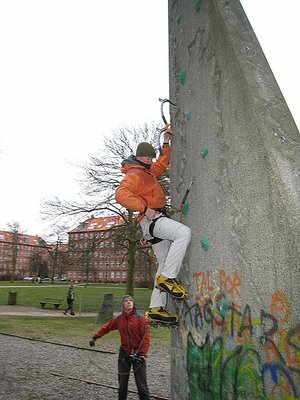 Another option if you like drytooling training in Copenhagen is the outdoor climbing tower on Artillerivej 71 as previously described on my blog. There you climb on big wooden holds which gives more physical pump but less technical training. 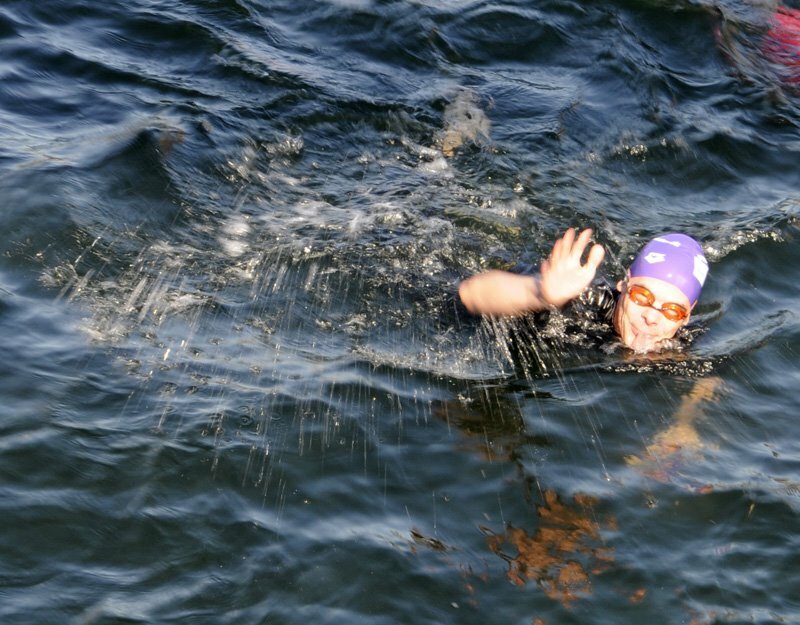 Today I participated in the 2 km open water swimming contest Christiansborg Rundt for the second time. 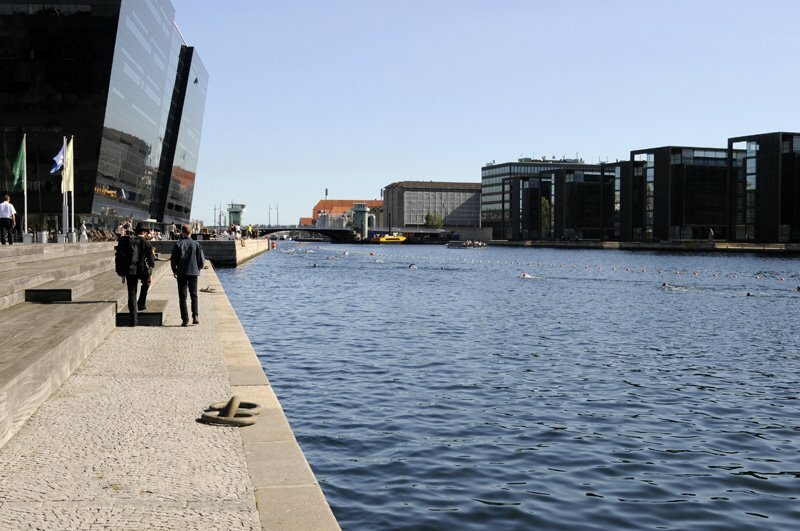 It is a great race in the harbour of Copenhagen swimming in the canals surrounding Christiansborg Palace - the place of the Danish Parliament. This year I completed the race in 47 minutes 24 seconds which is 36 seconds better than my 2006 time - and this year the route was even 100 meter longer than in 2006! 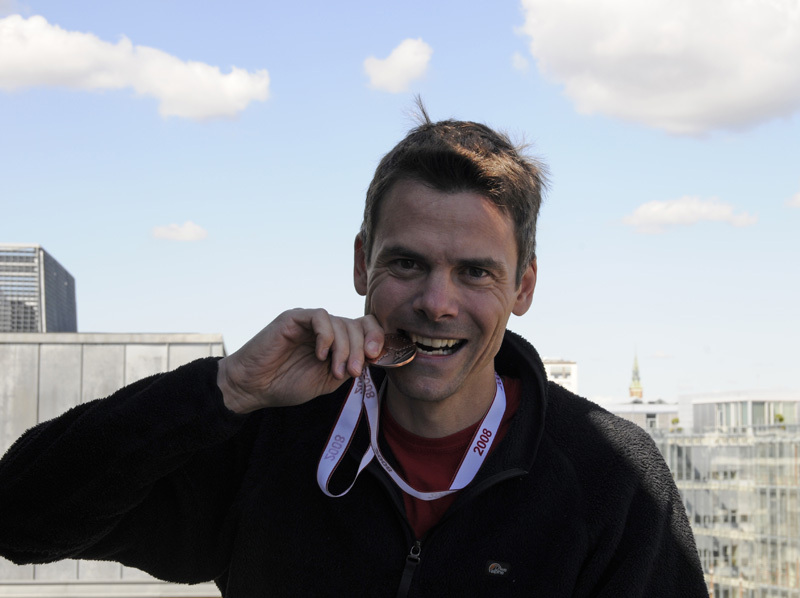 I was thus quite happy with myself although I realize it is not an Olympic record! I ended as number 328 out of 411 males - so at least I was not last in the race :-) I was also just happy not to freeze my but off in the 18 °C cold water! It is a great event with a lovely atmosphere and it is just fun to watch the oldest part of Copenhagen from that angle! The start of my heat. I had enough surplus of energy to wave to the photograph (= my wife Elvira who could not participate this time because of her recent delivery of our baby). You get to swim past some of the most famous buildings in Copenhagen such as the Royal Library "Black Diamond" seen on the left (I am a little dot in the water on the right). To celebrate my 40th birthday in August, my wife Elvira has given me a trip to Spitsbergen (Svalbard) where we will be kayaking for a week at 7o° N latitude! I am pretty psyched by the prospect of kayaking in the icy waters among lots of interesting wildlife. On one side I also hope to see polar bears, but not too close to my kayak of course! 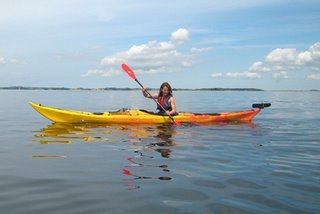 We both have some experience with kayaking and canoing, but thought that we should get to a higher level before engaging in such a wild trip. This weekend we thus met with my climbing friend Martin Ploug, who is one of Denmark's highest accredited kayak instructors. One of the main purposes of the weekend endeavors was to enter and exit the kayak under all kind of conditions. 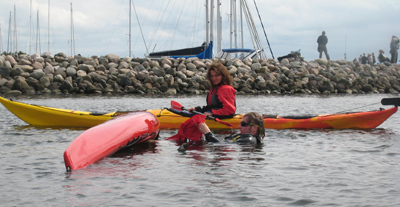 We were thus taught partner rescue and self rescue using a paddle float (which is what Martins demonstrates with Elvira watching on the picture on the right). Most importantly, we also trained how to stay in the kayak whenever possible by either making quick moves with the paddle - or by the reputed kayak rolls. Much to my surprise, I was able to make a 180° C to C roll on my second attempt. Finally, just before we stopped the training I tried to pull a 360° Eskimo roll - and succeeded! Wow - I could hardly believe my own eyes when I came to a stop on top of the water after rolling all the way under the kayak. Elvira shot a short video of Martin (in front) and myself (in the back) making Eskimo rolls, which you can download in iPod format by clicking here. Very cool weekend - and now I cannot wait for the trip to Spitsbergen! 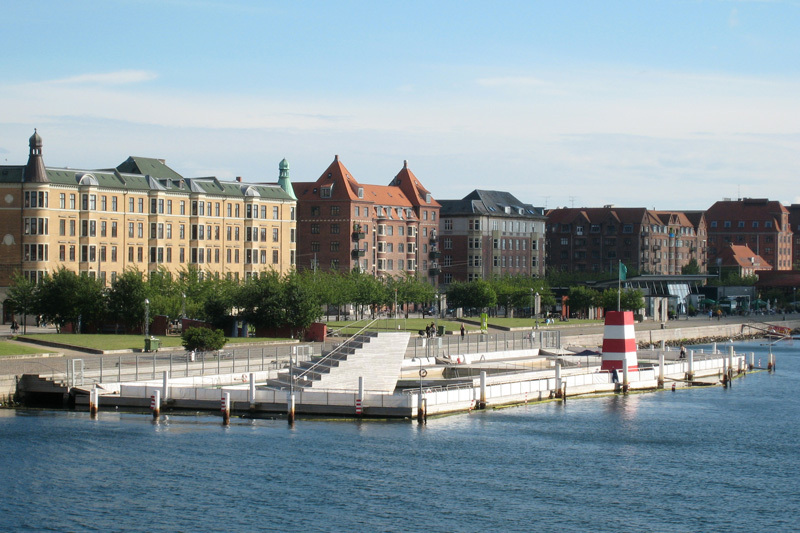 Did you know that Copenhagen has one of the only harbours in the world that is so clean that you can swim in it? 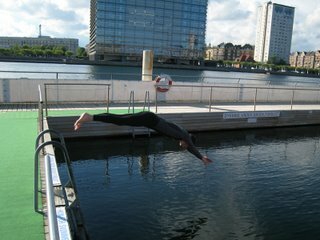 To my luck the county has placed a harbour bath with a 75 meter open water swimming pool on Islands Brygge just 10 minutes walk from the city center and 5 minutes walk from my home. In the summer I thus usually swim 10 lanes on my way home from work every day, which is very refreshing. 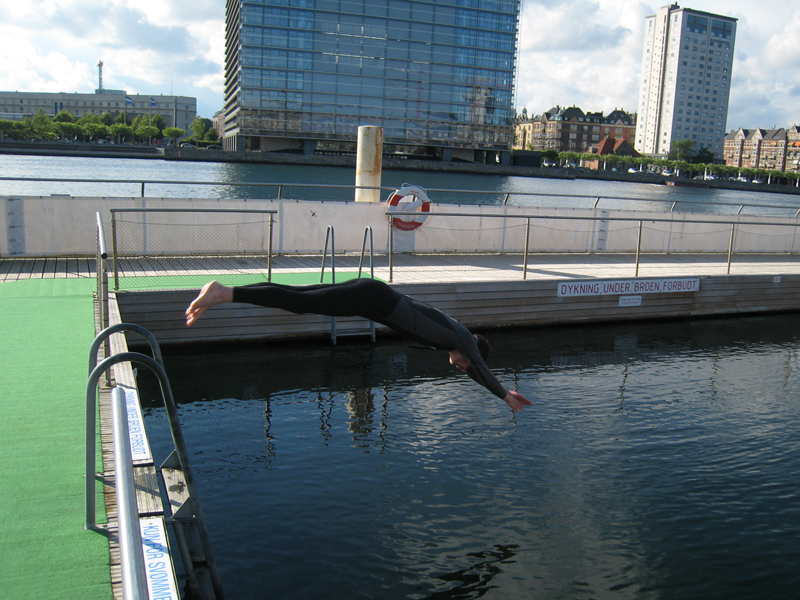 Today I began the training, albeit the water is still a bit cold (19 °C today). I thus wore a 3 mm neoprene suit which makes a dramatic difference. Actually, the suit is also nice to wear later in the summer to avoid stinging jelly fish! Last year, the swimming union of De nmark organized an open water competition swimming around the channels of the Danish Parliament, Christiansborg Palace. I participated and finished 152 using 48 min to swim the 1.9 km! Not a stunning finishing time, but it was really cool to swim in the channels and under the bridges, which are normally off limits for swimmers (because of dangers being hit by a boat)! The competition will be repeated on August 25 this year (www.openwater.dk/t2w_924.asp). Unfortunately, I will not be able to participate this year due to travels, but give it a try if you have the time!